Prevent messes and promote sanitary garbage disposal at your office, education facility, healthcare center, restaurant, and more with this Continental 8322GY 23 gallon wall hugger gray trash can! Made of heavy duty plastic, this trash can is built to withstand almost any environment. The gray color is simple and neutral, so it easily complements any decor. The compact 23 gallon size is designed to fit in tight spaces and is great for placement under standard work tables! Thanks to its rectangular shape, this receptacle can align with the wall, a cabinet, or desk. Because of it's small footprint, this trash can is ideal for kitchens, food trucks, and other venues with limited space. In addition, this wastebasket easily stacks inside other receptacles, allowing for efficient, space-saving storage when not in use! Disposing of trash is made easy, with a built in grooved bottom to easily lift up your trash can. Add this Continental 23 gallon trash can to your business for dependable use and durability, without compromising style and space efficiency! We bought two of this trash cans. quality is great, the site just right for a small fast food restaurant. Glad that we purchased for our restaurant. Slim trash can that fits just about everywhere. I worked in a restaurant for 10 years and they used the same trash can all the time, for what i see this is the one and i hope it last that much as well. It is a nice tall trash can. Very narrow like described. Unfortunately ours came squished, but customer service reshipped us a new one. It is just what we needed. The price of these can't be beat! We really like the slim wall hugging part particularly in our smaller bathrooms to leave better traffic flow. These are great space saving trash cans. They slide easily into small and more compact places. They are easily to clean and have held up well from everyday abuse. The best slim trash can ever and the price is cheaper than lot of places , we bought 3 of them and the color is perfect and they dont take much space in the kitchen . This gray trash can is just what I was looking for. It's tall and slim, so it looks great in our bathroom. It has a matching gray droop shot wall hugger lid that we purchased as well. This is the best price online. Does continental wall hugger trashcan is a nice slim wastebasket for any restroom. Tucks nicely in the corner doesn't take up much space. Available in all colors but my favorite is this gray one. This great little trash can is perfect when you have just a few inches of space. It disappears up against the wall, is very durable and easy to clean. This Continental trash can is made of sturdy plastic and is similar in size and shape to the Rubbermaid Slim Jim trash cans. These cans fit nicely in smaller restrooms and hug the wall nicely. The slim trash cans are definitely a must in a tiny space. We have 3 of these in a kitchen that is on the small side. They hold a lot and are tough. Highly recommend. I need it a slim high-capacity trash can to fit in my bar. This trash can can hold a lot of trash and is Slim enough to fit even in this small workspace that you are given in a bar. Great trash can. Slim enough to fit in tight spaces without losing trash space. Sturdy but light weight so you can easily take it outside and hose down when it gets dirty. You just can't have enough of these. They are slim and fit in places where other trash cans would not. They have all held up very well. Tall trash can is very convenient. Makes clean up easier. They are heavy enough to stand ground. They are tall enough to slide up to counter top and wipe counter waste into the trashcan when cleaning up. 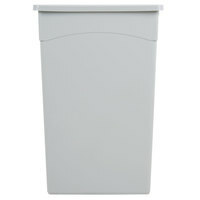 These continental wall hugger trash cans are great for small restrooms or offices. Gray plastic construction looks nice and holds up to constant use. Shiny surface is easy to clean too! I have two of these Wall Hugger trash can in my small bakery and they work well for 3 years now and cannot complain at all. Great simple trash can. Easy to keep clean, and fits in smaller kitchen areas that a round trash can would just be wasting space. Great Buy! We love using these wall hugger trash cans in our kitchen. They have a very slim profile which makes them easy to fit anywhere and not be in the way. This trash can is an extraordinary value. They are very sturdy and durable. Well worth the better price than more expensive ones. These work well and the gray color is nice too. Needed an extra garbage can that didn't take up a lot of space this worked perfectly. It's tall and slim and handles the volume of trash I need it to throughout a shift. What restaurant isn't using this garbage can? Really. They fit in small places, hold a good deal and are actually designed well. You can pick them up, dry them, flip them, and in the restaurant industry they have become dinner tables for a lot of cooks. These are very nice garbage cans, they seem as sturdy as the name brand cans which cost much more. If you are deciding between this can, and the more expensive name brand can, you should pick this one - the quality is as good, but the price is much lower. This trash can is great for slim and tight spaces. We have a small ice cream shop and this trash can blends in there well. These are the perfect space saving trash can. We have several of them around our small kitchen. They easily tuck under the edge of a table or along the wall. Only issue we've had is finding trash bags that fit snuggly in the can. Only one of our food service vendors carries the "slim jim" bag and they're kinda pricey compared to standard bags. These are great! I'm about to order more. They've held up for almost a year now with no signs of wear at all. They still look brand new! I believe they will last for years to come. Heavy duty trash bins. We have two of these in our kitchen and they work well. Slim so they can fit anywhere against a wall and not take up too much space. Just hose down periodically to clean. Get the matching covers as well. It is slim lined which makes it easy to find a spot to stow it. It is super durable. It has a large capacity but not so big that the trash is too heavy to take out. Will buy again if needed. This particular wall hugger trash can fits perfect in our restaurant where space is limited. We use the same size trash bag (33 gallon) and they fit great. There are a lot of options out there, but this is a great option for a low cost. It uses a 35 gallon bags, which helps with the cost and the size is great for our bakery. We have been using this can for several years now and cannot complain at all. They hold far more than would appear, clean easily and don't take up nearly the space of a regular can. We are sold on this style of can. Thanks! We have been in the restaurant industry for over 20 years and these are the best trash cans! The slim jim style fits anywhere and is easy to maneuver. Quality is great. LOVE this! The narrow size is perfect for discreet and convenient storage. Holds a lot of material but still manageable to empty. Super heavy duty to last a long time! These things really hold up. Our kitchen can get really busy and the trash cans might get a little rough handling from time to time. These trashcans are very durable and great for small kitchens with little room. They have a great little piece of plastic to tie the bags around which makes it easy for bags to stay in place! I love this wall hugger gray trash can. I have a small restaurant and I don't have enough space. This trash can is perfect because of its size, the color is discreet and combinable. This trashcan size is perfect for our space limited mobile coffee business. Make sure to order the correct size liners to ensure that trash is held efficiently. The price was just right and the shipping quick. We like the color of these trash bins because they blend in and don't stand out like some of the others, but still show any dirt or food that needs to be cleaned. The wall hugger trash can works great for us in places where round ones don't work well at all. Actually, we think round trash cans should be a thing of the past! How can a restaurant with limited space not have at least a few of these. As you can see, standard equipment tables are even built to accommodate them. Thanks Webstaurant for always giving me the best deal!